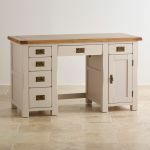 A good base for the home computer, from which to work or play. 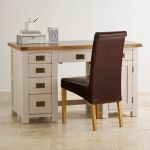 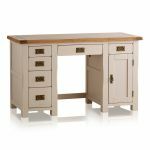 Enjoy the look of the attractive painted finish in a smooth putty colour with lavender undertones, gracing 100% solid hardwood base which is perfectly complemented by the rustic solid oak top. 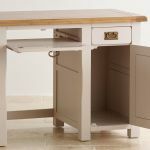 This desk is designed to help in keeping the wires and technology out of sight with six drawers of varying size – one designed for the keyboard – and one good-sized cupboard to house your computer. 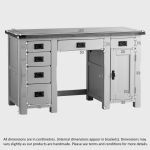 Solidly built, this desk will give you years of service.